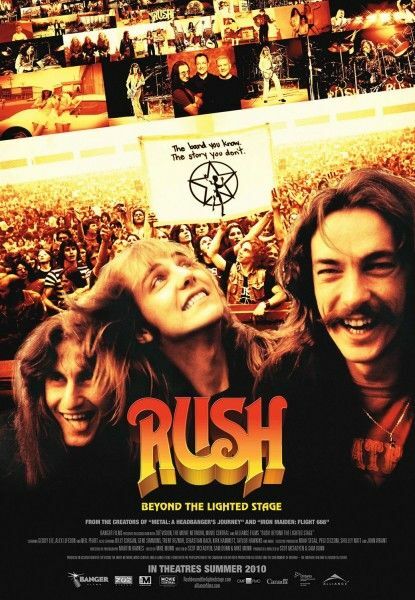 I just got my hands on the music documentary RUSH: Beyond the Lighted Stage, and I was absolutely blown away. Clocking in at almost two hours, plus an extra hour and a half of bonus features (yes, live performances included)—this documentary is jam-packed and well worth every penny. The only bad thing about it is when it ended; I actually pouted for a second or two when the credits came rolling on the screen. RUSH is one of the most iconic rock bands of all time. Despite that fact, they do not make it to many “Greatest Bands of All Time” lists, which is actually quite tragic. That theme of RUSH being a legendary rock band, but rarely given enough props for being so amazing, was actually a main focal point of Beyond the Lighted Stage. With interviews of notable and respectable rock artists like Les Claypool (Primus), Kirk Hammett (Metallica), Trent Reznor (NIN), Jack Black (Tenacious D), Mike Portnoy (Dream Theater), Billy Corgan (Smashing Pumpkins), Taylor Hawkins (Foo Fighters), Sebastian Bach (Skid Row), and Gene Simmons (KISS), it was fascinating to hear these big-name artists agree that RUSH does not get the credit they so greatly deserve. Thus, this documentary was born to tell the entire story of RUSH—from the very beginnings and on. Even though RUSH has been around long before I was born, I appreciate them as an extremely talented trio with the ability of creating musical sounds that I can only dream of perfectly recreating. I actually heard about this band in college—from one of my favorite psychology professors. After inquiring about Hemispheres and 2112, two of my favorite RUSH albums to this day, I stumbled upon a band that changed my appreciation for beautiful music forever. I know fans range from people like me, who have only recently discovered the band, to people who have been passionate and loyal since the formation of RUSH, but it is quite hard to imagine anyone not appreciating this gifted band if you simply just love music. Beyond the Lighted Stage is captivating—showing that even though RUSH has always had cult followers, Neil, Geddy and Alex have a deep connection of friendship and a realism that does not focus on fame and glamour, allowing one to relate to RUSH in a way describing who these men have grown together to become. With never-before-seen archive footage of the band’s early days, you get to see that despite popularity, RUSH simply loved music and loved creating sounds, melodies, and rhythms reflecting awesomely skilled musicians. As a Canadian band, it was hard for them to get signed in the States; their sound was a unique one, but a sound that hypnotizes the listener in a way that almost cannot be described. Even though it took some time, the band did not give up, and it was a good thing that they stayed strong, since it was finally discovered that these three men not only deserved to be performing in the United States, but deserve to be playing all over the world.